This single rail folding salesman clothing rack with adjustable height display rail is one of our most popular portable rolling clothing racks that offer up to 72” of garment hanging space and collapses flat to be 52”L x 24”W x 5”H making it easy to store or transport. The rack requires no tools for assembly and when it’s fully extended this rack measures to be 48”L x 24”W x 55 to 65”H, with a 48” long display rail that features two 12” long extension bars that extend the overall length of the display rail to 72”L. When the rack is fully extended the height of the display rail can be adjusted by push of a button with the starting height is 60” from the ground and adjusting in 5” interval to 60” or 65” high from the ground. 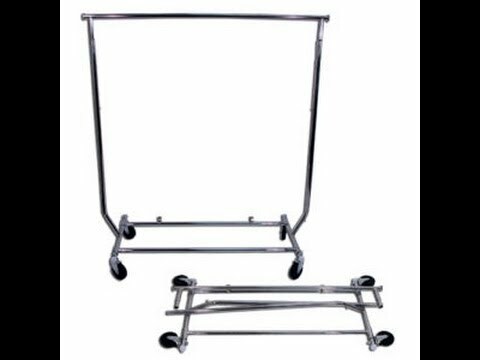 The adjustable height display rail gives it the ability to disapply range of different size garments and for rolling casters make it easy to move around.